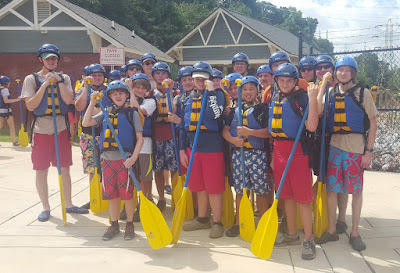 The weekend of Aug. 19-21, Troop 50 Scouts and leaders took to Columbus, Ga., for wet and wild whitewater jaunt down the Chattahoochee River. During the three-day, two-night campout, the troop called Uchee Creek Army Campground at Ft. Benning home. After spending Friday evening setting up the campsite, preparing dinner, and adjusting to the hot and humid camping environment, the troop suited up for its whitewater adventure. Scouts and leaders split themselves between large-group rafts and two-person inflatable duckies for the roughly two-and-a-half-hour trip. The river offered scenic views of historic Columbus, and for a few, underwater experiences at the hand of a few rough rapids! The troop picnicked on the grounds of Columbus State University’s Coca-Cola Space Science Center before touring the facility’s offerings. Scouts were able to view space-themed exhibits, try their hand at maneuvering spaceflight simulators, and watch astronomy shows in the center’s domed, omnisphere theatre. Many Scouts (and leaders) also favored the cool, air-conditioned environment the center offered the heat- and humidity-stricken troop! The troop returned to its campsite later Saturday afternoon, where patrols were able to prepare dinner at a leisurely pace and enjoy time for fellowship while awaiting the cooler evening temperatures to arrive. On Sunday, after preparing breakfast and packing up troop gear, Chaplain’s Aide Aiden led the troop in a Sunday devotional service centered around the traps we fall in with petty fighting and quarreling, and their adverse effects on our relationships. At the troop’s Monday Patrol Leaders Council, youth leaders praised the spirit of cooperation observed at the campout. Patrols were complimented on efficient set-up efforts, menu-planning and meal cleanup, and the overall fun everyone experienced. Youth leaders also noted the benefits of sharing the lessons learned when planning didn’t always prove successful, the need to better follow the quartermaster structure of using troop gear, and pre-campout food shopping. The troop’s next outing will be Sept. 10-11, when it goes canoeing at a location to be determined. For more photos from this month’s campout, visit the troop’s online photo album.